The fathers of the Church consistently remind Christians that we are to guard our mouths. We sing in the vespers verses, "Set a watch O Lord before my mouth, keep the door of my lips!" 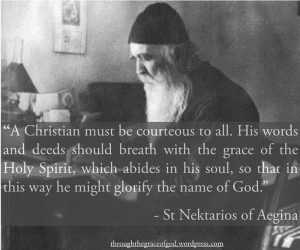 I will occasionally post the saying of the fathers on this, or like posts by others that remind us of our duty to engage others in love, in charity and in abject humility. Sadly, though, sharing posts like this brings out the worst in some Orthodox, who cannot believe that they are actually being asked to live out the same thing we ask liturgically. Assuming themselves to be wiser than the saints, and others apparently to be dumber than rocks, they contest against the fathers, with statements like "Christ wasn't courteous when he chased the moneychangers from the temple" or "John the Baptist spoke harshly when he called the Sadducees a brood of vipers." These predictable protestations remind me of the "faith alone" protestants who all point to the thief on the cross as "proof" of their doctrine. Let's understand precisely what the saints are telling us. They are not saying one can never rebuke another. They are not saying that we do not speak the truth, even in strong terms if needed. These reminders to us are calls to us to constantly fight the passions of pride, anger and ego - each of which can cause us to give a poor witness of the faith to others. The ones who truly need to be bound by this rule are those who will argue that it doesn't apply to them. They cite the harsh talk of holy men and claim that they are called to speak thusly. In other words, to justify the very things that the fathers teach against, they must compare themselves to Christ or the Forerunner. To put it in southern terms, "they ain't them." To aggregate to one's self a position comparable to Christ or the Forerunner (who the church teaches was "shown in truth to be the most honorable of the prophets") is such an utter display of pride and ego as to defeat anything else that is asserted. And let us not lose sight of this: if we all had the discernment of Christ or the Forerunner to guard our mouths, these admonitions from the fathers would be completely unnecessary. But we don't. Too often what we tell ourselves is "speaking the truth in love" is in reality screeching pridefully at those who disagree with us. We aren't chasing out the moneychangers to sanctify a temple for God, we are inflicting wounds on our brothers to assuage our own egos. Indeed, if we had the wisdom of the fathers, we wouldn't need to be told these things because the ascetic discipline on our lives would have given us the tools to fight these passions. Rather, when one seeks to make themselves an exception to these teachings, they demonstrate only that they are the ones who should most be bound by them. So, dear brothers and sisters, receive the teachings of our Holy Fathers with humility and joy, for the practices they urge are for our salvation. When we consider ourselves bound, only then may our tongues be loosed! So long as we struggle against their wise counsel, let it be known that we show our mouths ever in need of the watch. We are not Christ, nor are we the Forerunner. And we are not wiser than the fathers. Abba Poemen warned "If we remembered that it is written, "By your words you will be justified and by your words you will be condemned," we would choose to remain silent." It is, in part, our lack of discernment that condemns us by our own words. Let us take up the ascetic discipline of guarding our lips, both for our salvation and for the well being of those we are tempted to speak against. This entry was posted in Writings and tagged asceticism, courtesy, ego, forerunner, jesus, john the baptist, kindness, pride, rebuke, silence. Bookmark the permalink.